We are solving series of problem on the concept of expansion of gases. 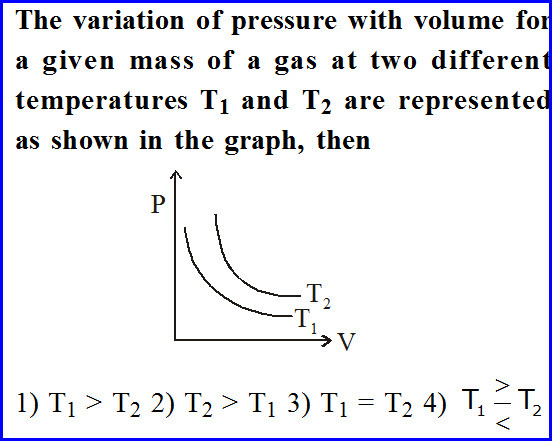 Pressure of the gas varies proportionality with the variation of temperature. It is also true that the variation of volume is proportionate to the variation of temperature at constant volume. Basing on this concepts,we can define different scales of temperatures and different gas thermometers. We also have ideal gas equation according to which the product of pressure and volume is directly proportional to the absolute temperature. The constant there is the product of number of moles and universal gas constant. It is constant for all the kinds of gases all over the universe. 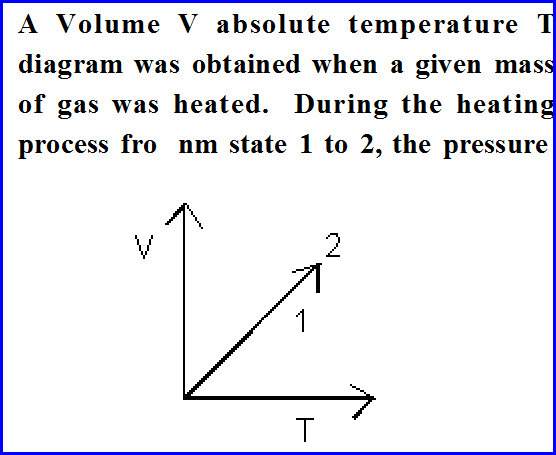 Variation of volume of the gas with absolute temperature is given to us as shown in the diagram below. We need to find the what happens to the pressure during this process. As the graph is a straight line passing through the origin, pressure is constant and hence it is not a variable at any point. The solution is as shown in the diagram below. Variation of pressure with volume is shown in the graph for two different temperatures. We need to find the relation between the temperateness. The variation of pressure with volume is as shown in the diagram below. We know that the product of pressure and volume is equal to the product of universal gas constant and absolute temperature. 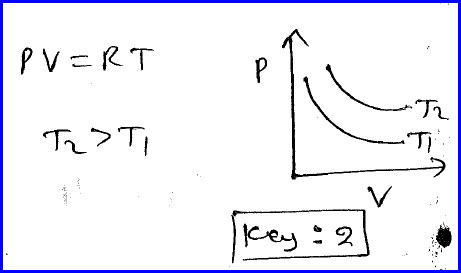 Thus the slope for the second temperature is more and hence that temperature is more. During an experiment an ideal gas is following a certain rule as given in the problem diagram. The initial temperature and volume of the gas is given to us. If volume of the gas is doubled, we need to know what happens to the temperature. As the gas is ideal gas equation, it satisfy the ideal gas equation also. 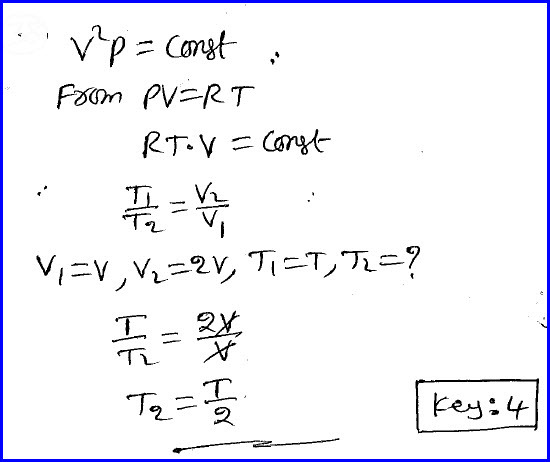 We can use the pressure value from ideal gas equation and substitute it in the given relation of the problem. Then it can be proved that the volume and temperature are inversely proportional to each other. Then the problem can be solved as shown in the diagram below. A horizontal tube of one meter length has uniform area of cross section and it has a mercury pellet of length 10 centimeter at the middle. 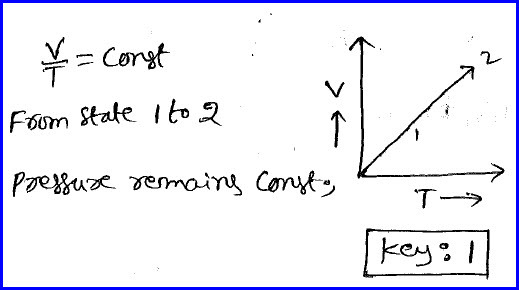 The temperature and pressure at one end are given as shown in the diagram below. If we know the pressure at the other end and the problem is as shown in the diagram below. We need to apply ideal gas equation to solve the problem. 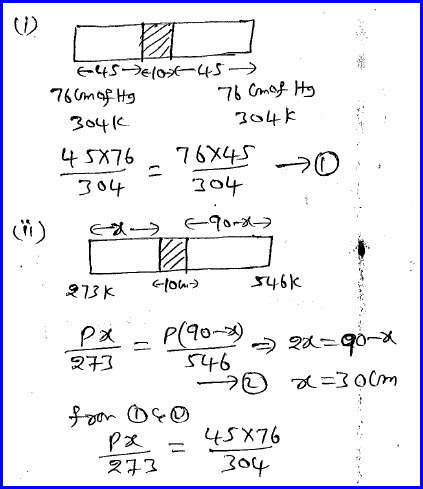 As area of cross section of the system is constant, we can write the volume as the product of area of cross section and length of the air column and volume is proportional to the length of the air column. 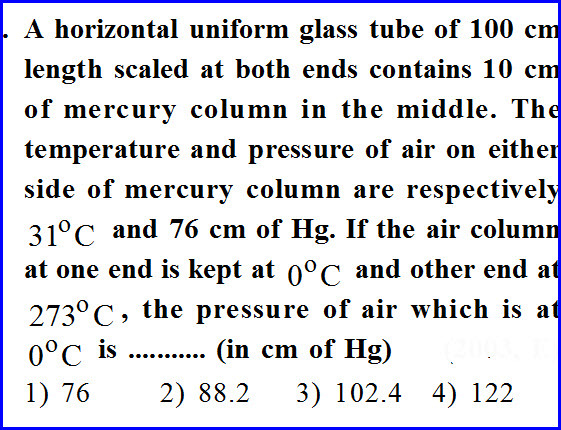 As temperature at one end increases air column there expands and pushes the mercury pellet to the other side. Thus on the higher temperature side there will be more air column and vice versa. By applying the ideal gas equation, we can solve the problem as shown in the diagram below. It is further simplified as shown in the diagram below. We need to find out at what temperature RMS velocity of hydrogen gas molecule is equal to the RMS velocity of the oxygen gas molecule at the given temperature and the problem is as shown in the diagram below. We know that RMS velocity depends on the nature of the gas but in this case both hydrogen and oxygen gas are diatomic in nature and it is not a factor here. It is inversely proportional to the molecular weight and it is 2 for hydrogen and 32 for oxygen. 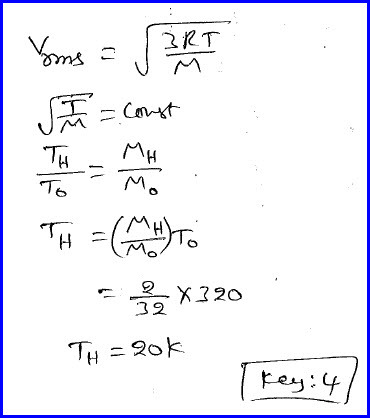 We can write the formula for the RMS velocity and solve the problem as shown in the diagram below.